At UWCSEA we want to foster students' ability to wonder and question, that is expressed in the act of inquiry. This is as true in K2 passion projects as it is in IB extended essays. 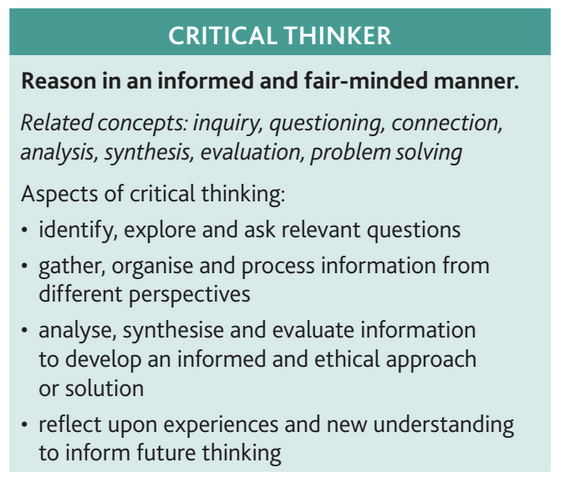 Inquiry is a manifestation of our profile skill of 'critical thinker'. We want students to ask questions, gather and organise information, analyse information and reflect throughout the process. These aspects of inquiry are clearly shared with the skill of critical thinking in our Learner Profile. In this process, in an age appropriate way, students are supported in developing specific research skills. Librarians collaborate with teachers to support the learning of research skills that complement the inquiry process. These four stages of inquiry might be expressed in a number of different ways, and indeed there are different inquiry models. Inquiry is not a linear process, and involves a back and forth between stages in response to the unfolding experiences of the inquirer. This should be bourne in mind when looking at models that suggest very distinct, sequential stages for inquiry. There are multiple jumping in points for inquiry. Further, different stages of the process, such as analysis of information, can be stand alone learning experiences where appropriate.